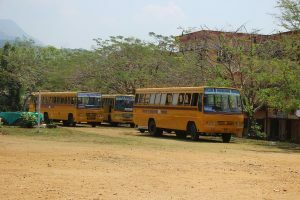 College is situated on the eastern parts of the district but transportation to the college is made easier by our bus management system. P T A of the college manages the bus running and its maintenance. College provides sufficient transportation facilities to staff and students. Presently there are four buses running in different routes. Considering the number of students from different locations, each year we are increasing the number of trips. To arrange this properly, we purchase new buses periodically. Now we arrange daily trips to Kidangoor, Pala, Ponkunnam via Kanjirappally and Erattupetta. Bus schedules are periodically revised to reduce the rush and also for the convenience of staff and students. Polite and amiable behavior of the bus crew is ensured. Now we arrange daily trips to Kidangoor, Pala, Ponkunnam via Kanjirappally and Erattupetta.Considering that sufficient transportation facility is not available to students from the eastern part, from August 2016, we have a hired trip to Kaippally-Enthayar in Mundakkayam route.